All SIMONDS®, C.H. HANSON®, MEGAPRO®, and C.F. COOPER® tools, having passed a rigid factory inspection, are warranted against defects in materials and workmanship. Any SIMONDS®, C.H. HANSON®, MEGAPRO®, and C.F. 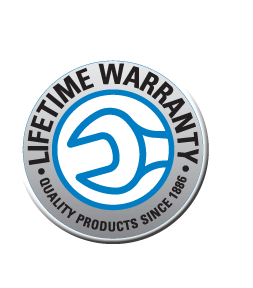 COOPER® tool that is abused or used for purposes other than those for which the tool was designed, is excluded from this warranty. If a SIMONDS®, C.H. HANSON®, MEGAPRO®, or C.F. COOPER® tool appears to be below our manufacturing standards, it may be returned to the factory. If factory inspection determines that the tool is within this warranty, the tool will be repaired or replaced without charge. Protect your eyes, ALWAYS WEAR SAFETY GLASSES. NEVER strike the tool or use it as a striking tool. NEVER expose the tool to direct heat from welding torches. NEVER use handle extensions on the tool to increase leverage. NEVER use the tool as a structural support. ALWAYS keep your tool clean. Inspect it frequently and replace it when worn.